Ordering Your Promotional Products - The Simple Way! In our technology-driven world of automated chats, generic forms and touch tone dialing, we appreciate that placing an order can be frustrating at times. GoPromotional prides itself on focusing on the person-to-person connection from the very beginning to the very end. People like to deal with people, and human interaction and the relationships we build with our customers really matters. If you have questions relating to your order, contact your Account Manager directly, give us a call on 0800 0148 970 or e-mail hello@gopromotional.co.uk and we will respond asap. We'll guide you all the way, but here's a breakdown of the simple steps relating to the order process. Browse our vast selection of promotional products by navigating through our simple to use website. Begin by choosing a product category or typing a keyword into the search function. Once you have selected your product, simply complete the “Super Fast Quotation From” on the right-hand side of the screen, or give us a call on 0800 0148 970. You can also e-mail us at hello@gopromotional.co.uk. Once you have completed the quotation form you can either “Check-Out” or alternatively continue browsing for additional products, add them to your quote basket and check out when you are ready. Please note that this does NOT in any way oblige you to place an order. Upon receipt of your quotation request, one of our Account Managers will prepare a detailed quotation outlining all the product details and print specifications. We recognise that your time is valuable, and as such we will aim to get your quotation back to within 30 minutes, if not sooner so that you can continue with your other important daily tasks. Your Account Manager will then give you a quick courtesy call, usually within 24hrs, just to ensure that you have everything you need and that the quotation meets your requirements. If you are happy with your quotation and wish to see visually how your logo may look on a particular product, simply email your logo across to your Account Manager and they will instruct our Artwork Department to prepare a FREE “Virtual Sample” of the product featuring your logo. We usually get these turned around in a few hours, and it will provide you with an excellent idea of how the finished product will look. Once you are happy with everything and are ready to place an order, simply contact your Account Manager and they will get the ball rolling as soon as possible. If we have already received your artwork, then we will prepare the final artwork proofs for your approval prior to sending to production. If you have not sent your artwork through, simply send email it to your Account Manager with any detailed instructions. If you have any questions regarding the best way to supply your artwork, then please see our artwork tips and everything you need to know should be explained. Once your artwork has been prepared your Account Manager will email this across to you along with the final invoice detailing all delivery details and costs. At GoPromotional we have a team of professional graphic designers who will prepare your artwork your specific requirements. Once completed, your Account Manager will email this across to you along with the final invoice detailing all delivery details and costs. This process is normally completed within the same day, ensuring that you can see exactly what you're ordering, and allowing you the opportunity to make any last-minute amendments. Once you are 100% happy with everything, and not until we receive your final signed approved to proceed will we progress to production. Your total satisfaction and confidence in what you are ordering is of paramount importance to us! Once we have received your signed confirmed to proceed, our experienced production team will move into action to ensure that your products are produced to the highest of standards, imprinted with your logo and delivered to you on time. 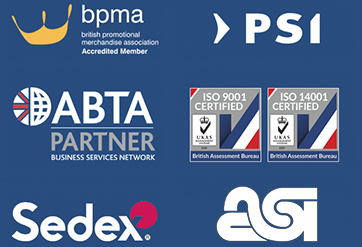 With our strict quality control systems, and as a member of the BPMA, you can be assured that we have the right people and systems in place to ensure your order is processed in the most proficient manner. Every order, no matter how small or large is treated with exactly the same integrity. So, whether you are ordering a simple one colour print delivered to the UK, or a fully bespoke project delivered to multiple global destinations, with GoPromotional this is what we specialise in and we have no hesitation in saying we are pretty good at it! Communication is paramount, so we will keep you posted on the status of your order. We will let you know when the goods have been dispatched and if required provide you will full tracking details for your peace of mind. You will be notified when your order has been dispatched, but we will also contact you to ensure that you are happy with everything. Your total satisfaction is exceptionally important to us and our aim is to not only meet, but exceed your expectations. By doing this, we believe that you are more likely to come back to us for your subsequent requirements! The satisfaction of our clients is very important to us, so we take all feedback, good or bad extremely seriously. This enables us as a team to continue to provide a high level of service and take on board any areas which we could potentially improve on. We're very proud of what we do and how we conduct ourselves, and that comes down to the fact that we have fantastic team of people in place who are exceptionally dedicated and passionate about continually striving to provide the best service they possibly can and continually seek to learn and develop their individual skills and as a team.